We are a collecting culture. We collect toys, stamps, books, vinyl records, comic books, photos, sports memorabilia, and the list goes on and on. What happens when you need to put away your collection and you don’t have the space to store it? That is where self storage comes into the picture. Storing many types of collectibles in a hot attic or damp basement could ultimately ruin the items. Placing the collectible items in a climate-controlled self storage is the best option to protect the collection for years to come. Storage World offers climate controlled storage units at our 3 locations in Decatur, Jonesboro and Stockbridge. On top of storing these items in a climate-controlled storage unit, it is important to follow some basic storage tips to keep the items protected in storage. Listed below are a few tips to keep your collectibles safe and in great condition when they are being stored. 1. Comic books can easily be damaged by extreme humidity and temperatures. Keep the comic books away from light and heat sources. The light can fade the comic books over time. 2. 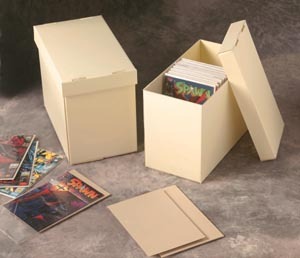 Most comic shops will sell special acid-free comic book storage boxes. These boxes come in a smaller size for up to 100 comic books to a larger size, which can hold up to 300 comic books. 3. Store you comic books in a polypropylene bag with acid-free comic packing board. This will keep your comics protected and in good condition. For rare or expensive comic books, use Mylar sheets for the protective covering. 4. Store the comic books upright in the boxes. 1. Store vinyl records away from any heat and light sources. 2. Store the records standing up in a plastic crate or a very sturdy cardboard box. 3. Do not stack or have vinyl records lean against one another. This could cause warping and breaking of the album and also damage the cover art. 4. Do not stack boxes of records more than 4 boxes high. The records are heavily and with too much weight, they could crash down ruining your entire collection. 5. Store vinyl records in a paper sleeve if you do not have the original album cover. 1. Do not store books on their spine inside a box. Stack books with the heaviest on the bottom and the lightest on the top. Also, pack books in smaller boxes, as the boxes can get very heavy. 2. Remove all bookmarks and items inside the book, as they can cause a chemical reaction to the book’s paper over time. 3. Do not store books in a plastic bag. The bags cause moisture to build up, which will damage the spine, cover and pages of the book. 4. Protect books from extreme humidity and temperatures and keep away from head and light sources. 1. The value of the collectible toys is directly tied to the condition of the item. Keep toys in the original packaging as much as possible. Packaged toys have more value than toys that have been played with. 2. Keep stored toys away from direct sunlight to prevent discoloration. Extreme humidity can cause warping and breaking of plastic toys. 3. Make sure to properly wrap and pack boxes of collectible items. Make sure to use filler material such as bubble wrap or newsprint in fill up the boxes. 4. If you are storing collectible dolls, make sure to store them in fabric boxes or bags. Cardboard or plastic boxes can produce acid or chemicals that can ruin a doll that is in storage over a long period of time. 5. Don’t over pack a box of collectible toys. Wrap each item (especially if they are not in their original boxes) tightly and use filler. Pack these collectibles in smaller boxes and store on the top of stacks.